In the breakup of the Soviet Union Kazakhstan became a member of the Commonwealth of Independent States in 1991. It is bounded by southern Russia, Uzbekistan, Kygyzstan and China. 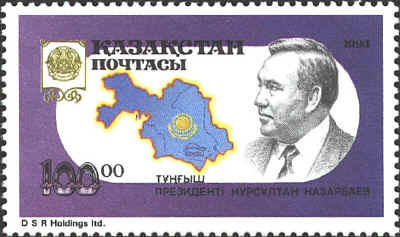 The stamps shows a map of Kazakhstan and a picture of President Nursultan Nasarbajev. When the Soviet Union collapsed in 1991 eleven former republics asserted their independence and together formed the Commonwealth of Independent States. 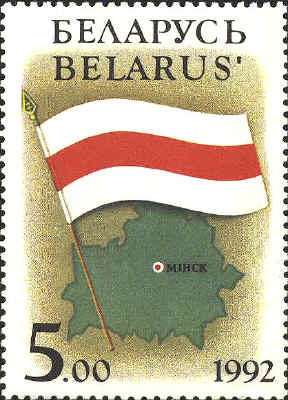 Among the first stamps issued in 1992 by Belarus, formerly White Russia, were a map of the State and its National Arms. On the map stamp the capital, Minsk is identified in Cyrillic lettering, and the national flag is shown. Azerbaijan is the southernmost part of Russia in Europe. Together with ten former Soviet republics it established the Commonwealth of Independent States in 1991. 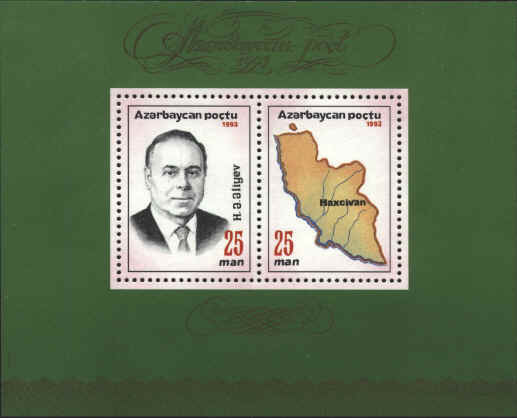 The stamp was one of the earliest stamps of the Soviet Socialist Republic of Azerbaijan issued in 1919. 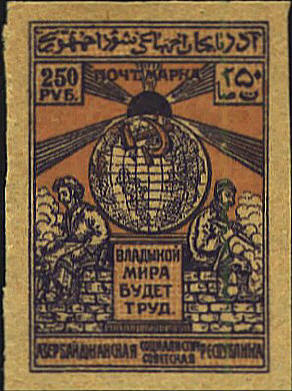 It shows workers and a globe under the hammer and sickle. There are two territorial anomalies in Azerbaijan. Naxcivan is an enclave of Azerbaijan separated from Azerbaijan by Armenian territory. Nagorno Karabakh is a Christian Armenian enclave within Azerbaijan. 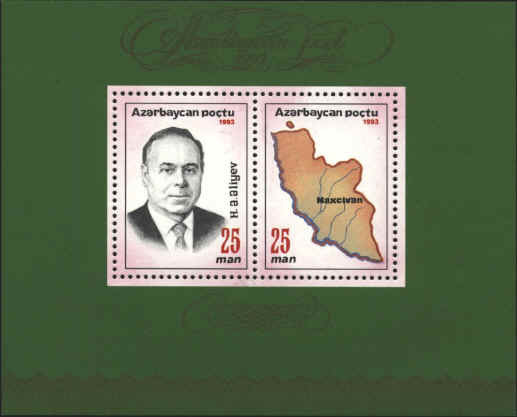 The souvenir sheet asserts Azerbaijan's claim to Naxcivan. In the early 1990s, after the dissolution of the USSR, the republic of Azerbaijan attempted to use the Latin alphabet rather than the Cyrillic. In Cyrillic the letter that looks like an “H” is pronounced “N.” In 1993 an error was made when the souvenir sheet showing the enclave of Naxcivan or Nakhichevan was issued. The name of the enclave was spelled “Haxcivan,” using the Cyrillic “H” for the Latin "N". Almost immediately the sheet was reissued with the spelling corrected to “Naxcivan” in Roman letters. The effort in the 1990s to turn to the Roman alphabet was not realized, but in 2001 the Azerbaijani president, Heidar Aliev, ordered that “for strengthening the country’s sovereignty, in respect for its history and cultural development, norms of Azerbaijanian language and Latin alphabet must be kept. All official documents, newspapers and magazines, as well as advertisements and signs will now be in Roman letters. The most important scientific and literary works will be reprinted in Roman letters also."